Perhaps more premarital counseling might have helped my husband and I avoid untold pain our first year of marriage. Steve and I could not agree on what honest-to-goodness strawberry shortcake was. I spent two sweaty hours picking the best strawberries. I entered my June-steamy, closet-like kitchen and, like my mother before me, baked a decadent white cake. I covered giant pieces with berries, and plopped vanilla ice cream on each, adding more berries. Finally, I buried my masterpiece with an avalanche of whipped cream. I presented my magnum opus and awaited raves. I hinted for a compliment. Note to you youngsters: don’t try this at home. Unless you really enjoy sleeping on a sofa. What kind of person would sacrifice innocent strawberries for breakfast food masquerading as a dessert? I refused to budge one inch. For our future children’s sake, I would allow only the highest strawberry shortcake standard in our home. Hubby said nothing more. I decided I would (choke!) use Betty Crocker’s biscuity recipe. Still, compromise was the name of the marriage game — for Steve, too! So I invented a shortcake we both appreciate. I added lots more sugar. I slathered butter on it to raise the cholesterol content to decent levels. Not only did this compromise save our marriage, but it has impacted our children, who actually asked for my recipe before they left home. While our kids-in-law secretly believe Mom Phillips is an alien from the planet Skorkxx, they will come if she makes strawberry shortcake. Tonight I’ll pile ruby-red berries on my husband’s piping hot shortcake and (this still hurts) pour milk over it. I’ll slather butter on mine, add berries, ice cream and fat-free Cool Whip. 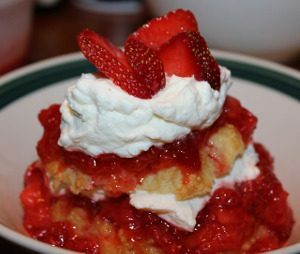 After 41 years, we still do shortcake different. But together, we have a berry good time. Did you and your spouse experience a similar crucial controversy during the first weeks—days—hours?—of your marriage? This entry was posted in Coffee Corner and tagged Controversy and Conflict, Food, Humor, Marriage, Rachael O. Phillips on June 22, 2016 by rachael. I grew up with my mom using the Bisquick recipe for Strawberry Shortcake! My husband grew up with a pound cake, as the cake. I’m still in favor of the Bisquick Strawberry Shortcake. Frank doesn’t cook much at all, and he will eat whatever I make. Occasionally, I will buy some pound cake at the grocery store and do it “his mother’s way”, but I prefer the Bisquick way! In the beginning of our marriage, he did say, “This isn’t the way my mother made Strawberry Shortcake! ?” I haven’t heard much about shortcake in a long time…maybe it’s because I haven’t made any in a l-o-n-g time…hmm, I think I’ll see about getting some Bisquick and Strawberries the next time I go to the store! Oh yes. We had a major blow up over Swiss steak. “Catsup isn’t made of tomatoes. ” he said smugly. “Read the label!” I shrieked. “AND there are green things in the dish, and mushrooms, too!” He whined. I ate Swiss steak for a week, and he ate Mc Donalds for a week. Battle number 1. 46 years later the food battle still goes on. Arrrrrgh!!!! I vote for your Swiss steak! (It sounds yummy!) If it’s not food, it’s closet space or driver’s seat placement or morning vs. night owl controversies. They keep marriage interesting, don’t they, Dori? Thankfully, we can go to the Great Referee who is in both corners. Thanks for commenting, and blessings on your day! God never stamped out cooky-cutter spouses, did He, Cindy? (Though sometimes I wonder if males and females are not only different sexes, but different species!) Thank God, He is there to help us work out our Great Debates and file off our rough edges–and help us laugh along the way 🙂 Thanks for your comment, and blessings on you and Jim! Thanks for your comment. Aren’t we blessed with wonderful guys!